The bishop of St David’s the Rt Rev Joanna Penberthy preaches in a live service from St David’s Cathedral, Pembrokeshire, led by the dean the Very Rev Dr Sarah Rowland Jones. This saint who embraced a simple life left in these final words to his followers an injunction to follow him in doing “the little things”. In the 899 years since his canonisation in 1120, believers have drawn strength from his example, and commemorated his life in words and music that have inspired a nation. Ahead of St David’s Day this week, The Very Rev’d Dr. Sarah Rowland Jones leads a live service from St. David’s Cathedral in Pembrokeshire, where the saint was laid to rest in the year 589. The Preacher is the Bishop of St. David's, the Rt. Rev'd. Joanna Penberthy. The cathedral choir, directed by Oliver Waterer, leads worship with music including Guide Me O Thou Great Redeemer (Cwm Rhondda), Dyma Gariad/Here is Love (Ebenezer), and Love Divine (Blaenwern) as well as a recently discovered medieval Responsory for St David, the Penpont Antiphonal. Please note this script cannot exactly reflect the transmission, as it was prepared before the service was broadcast. It may include editorial notes prepared by the producer, and minor spelling and other errors that were corrected before the radio broadcast.It may contain gaps to be filled in at the time so that prayers may reflect the needs of the world, and changes may also be made at the last minute for timing reasons, or to reflect current events. Opening anno: BBC Radio 4. It’s ten past eight, and time for Sunday Worship. On the Sunday before St David’s Day, we go live to St Davids Cathedral in Pembrokeshire. The Dean, the Very Rev’d Dr Sarah Rowland Jones leads the service; and the preacher is the Bishop of St Davids, the Right Reverend Joanna Penberthy. The service begins with theIntroit ‘Ubi Caritas’ by Durufle: “Where charity and love are, God is there”. Good morning, bore da, a chroeso: welcome to Britain’s smallest city, where, in the 6th century, St David established a community of holiness, self-sacrifice and loving service. This inspired not just those who joined him, but countless pilgrims ever since. Today people continue to come to this place, to be still, and pray, and be inspired by St David’s example, summed up in his final teaching to his followers to be joyful, keep the faith, and do the same ‘little things’ which they had seen and heard him do. We sing the famous Welsh hymn Cwm Rhondda, which is a prayer that David’s God and ours will guide us through life’s pilgrim journey: Guide me, O thou great Redeemer. O LORD, open thou our lips; And our mouth shall show forth thy praise.O God, make speed to save us: O Lord, make haste to help us.Glory be to the Father, and to the Son, and to the Holy Ghost; As it was in the beginning, is now and ever shall be, world without end. Amen.Praise ye the Lord; The Lord’s name be praised. Item 6: LINK – The Dean The Cathedral Choir will now sing verses from Psalm 92, which call us to trust in the God who is trustworthy, so we may live flourishing lives. Item 8: READING – Philippians 4:4-9 – Read by the Venerable Dr William Strange (Canon in Residence)A Reading from St Paul’s Letter to the Philippians, Chapter 4. The Bishop of St Davids, the Right Reverend Joanna Penberthy will shortly give the Address, after we’ve heard the anthem Jubilate – Herbert Howell’s setting of Psalm 100. Words from the last sermon of St David – Dewi Sant; words that have been cherished, loved and passed down through the centuries; words that are as relevant today as they were then. Dewi Sant lived in turbulent times: the Romans had left a hundred years before and the local British princes ruled in their tribal areas, now fighting, now allying with each other and the Anglo-Saxon invaders. The threats are different now, but we too live in turbulent and uncertain times, times for which the past offers us no roadmap. Dewi Sant’s words offer a simple way to live without one. Following St Paul, Dewi Sant is reminding his community that in changing and painful times, the God and Father of our Lord Jesus Christ, who created and sustains all that is, can be trusted. Like St Paul, Dewi Sant was not calling for a rejoicing that shuts its eyes and ears to reality, a whistling in the dark; but for a rejoicing that is rooted in trust, rooted in a learning to trust the love of the God who calls us into being, a rejoicing that is open-eyed to the complicated reality of our own lives and the complex times in which we live. Trusting in God is not like having a magic wand. Problems cannot just be waved away but they can be lived through, moment by moment, patiently and even joyfully when we open our minds and hearts to the God and Father of our Lord Jesus Christ, who comprehends the thoughts of our minds and the prayers of our hearts. “Rejoice and keep your faith.” Dewi Sant encourages us not to lose heart. We are to hold tight to the God who raised Jesus from his borrowed tomb to new life. If we are honest though, we cannot always find it in our hearts to rejoice. Dewi Sant’s call to keep our faith and the Creed of the Church encourages us. Come what may we are called day by day to keep to the discipline of trusting God, even when that seems counterintuitive. Keep your faith, keep the faith. The faith Dewi Sant tells his community to hold onto is not a faith of their own imagining, it is the faith of the Christian community taught first by those who had met the Risen Jesus, a faith then handed on through the early centuries and summed up in the Nicene Creed; the faith statement put together by the Church in the fourth century. The Creed expresses the core of the Christian faith and is held in common by countless millions of Christians today. We hold onto this Creed and discover its reality afresh in our own lives. This reminds us that trust is not about feeling; it’s not about feeling secure, feeling safe; it is about having the courage to live out our Christian faith through the gospel values of love, compassion, peace and justice; come what may and whatever the cost, because holding on to our faith in Christ and to the Faith of the Church reminds us always of the bigger picture, pointing us to the unquenchable and enduring love of God in which our country, our world, our lives along with all that is; are rooted and held. This is the theme of the old Welsh hymn, Dyma gariad fel y moroedd. The second verse, sung in Welsh, describes how God’s mercy flows like a vast tide, and justice and peace meet, as if in a kiss. If we think this sounds arrogant, we are missing the point. In his final sermon, Dewi Sant doesn’t offer words, clever sermon illustrations, or intellectual and intricate arguments; not even the wisdom gained by his lifetime of steadfast Christian living. He offers himself as his sermon illustration: not because he’s vain, but because, in humility, he offers himself as a living example of how a flawed, sinful human being can draw daily on the grace of God, be rebuked and inspired by the words of scripture and the words of others, and live, using the twin walking poles of Christian discipleship, repentance and love, repentance and love, repentance and love. He points his community to their own experience of living alongside him. “The little things that you have heard and seen in me, do.” Just follow my example, live as I have lived. Dewi Sant is quoting St Paul’s words “what you have learned and received and heard and seen in me --- practise these things.” It seems like an arrogant claim …. And yet it draws on the central core of the Christian faith: the incarnation, the Word made flesh: even God used more than words. In the end, words are not enough. I will never forget my Dad’s gales of laughter when the first thing I did when learning to drive was to sit in the driver’s seat reading a book about learning to drive. I soon learnt that practice, practice and more practice under the watchful eye of someone who could already drive was the only way to get the hang of it: other people’s written words only got me so far. It’s the same with living the Christian life: we learn from our own faltering experimentation, and observing and reflecting on that of others. Dewi Sant had lived his life open to God and to his community. His relationship with God guided how he lived, and his experience of living his faith fed back into his relationship with God. Dewi Sant lived a life of loving, rejoicing experimentation in following Jesus. It most certainly didn’t make him perfect, but it was a life lesson to his community as to how to live humbly, lovingly, honestly, each with their own eyes open to their own imperfections rather than to the imperfections of others. He was an object lesson in grace. As we now have the courage to follow Dewi Sant’s advice and rejoice, to stand on the faith of the Church, to keep putting our faith in the God and Father of our Lord Jesus Christ and day by day to make our faith real in the love of our neighbour, so we, as flawed and imperfect as we are, can be for others signs of hope and people in whom God’s love is made real. “As for me, I shall walk the way which our fathers went.” No doubt they didn’t want to hear it, but these final words of Dewi Sant reminded the community who loved, trusted and depended on him that his life was coming to its end, as everyone’s must. But over fourteen hundred years later, we still repeat his words with love. Like him, we have the courage to offer our own little things, that by God’s grace, they may be signs of a greater love. All of us, wherever we are, can be signs and channels of the love and grace of God, as we offer the little things of our lives in simplicity, gentleness and hope. The choir now sing ‘A Responsory for St David’. This is an arrangement by our former Music Director and Organist, Timothy Noon, of a Latin medieval hymn of praise about St David. It comes from the Penpont Antiphonal, a 14th century Welsh liturgical book of musical settings both for daily services and for particular saints’ days, which only came to light in the 1960s: A little bread, a drop of water was David’s refreshment. Item 16: PRAYERS led by Paul and Maggie PaulLet us pray,Loving Father, give us grace to ‘rejoice always’ with eyes that are open to the complexities of our times, so your joy may be our strength in all that life brings us. Maggie: Loving Father, when we are tempted to lose heart, help us to keep the faith of Christians through the centuries, and follow the calling of your Son, our Saviour Jesus Christ. Paul: Loving Father, help us to ‘do the little things’ in humility and honesty, sharing your love and your hope in practical ways with neighbours near and far. Maggie: Loving Father, bring justice and peace to meet together, in the troubled nations of the world. Paul: Loving Father, throughout life’s pilgrim journey, hold us in your powerful hand, still our anxious fears, and bring us and all your children, safely to Canaan’s side where we will praise you forever. …the Father, the almighty,maker of heaven and earth,of all that is, seen and unseen. We believe in one Lord, Jesus Christ,the only Son of God,eternally begotten of the Father,God from God, Light from Light,true God from true God,begotten, not made,of one Being with the Father.Through him all things were made.For us and for our salvationhe came down from heaven;by the power of the Holy Spirithe became incarnate from the Virgin Mary,and was made man.For our sake he was crucified under Pontius Pilate;he suffered death and was buried.On the third day he rose againin accordance with the Scriptures;he ascended into heavenand is seated at the right hand of the Father.He will come again in gloryto judge the living and the dead,and his kingdom will have no end. We believe in the Holy Spirit,the Lord, the giver of life,who proceeds from the Father and the Son,who with the Father and the Sonis worshipped and glorified,who has spoken through the Prophets. We believe in one holy catholic and apostolic Church.We acknowledge one baptism for the forgiveness of sins.We look for the resurrection of the dead,and the life of the world to come. Amen. Item 18: LINK – The Dean We end our service by singing ‘Love divine, all loves excelling’, to another famous Welsh hymn tune, Blaenwern. A bendith Duw Hollalluog, y Tad, y Mab a’r Ysbryd Glân, a fo yn eich plith ac a drigo gyda chwi yn wastad. Amen. And the blessing of God almighty, the Father, the Son and the Holy Spirit, be with you all, ever more. Amen. 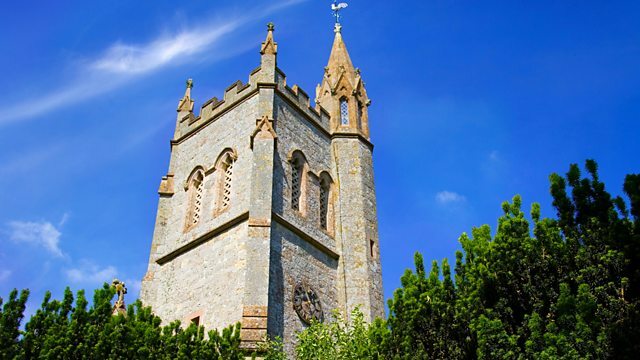 Closing anno from Radio 4:The organist Simon Pearce with ‘Jubilate’ by William Mathias bringing to a close this morning’s Sunday Worship, live from St. David’s Cathedral in Pembrokeshire. The service was led by The Dean, the Very Rev’d Dr Sarah Rowland Jones; the preacher was the Bishop of St Davids, the Right Reverend Joanna Penberthy; and the Cathedral Choir was directed by Oliver Waterer. The producer was Dominic Jewel. On 12th March, 1994, 32 women became the first to be ordained as priests in the Church of England. Twenty-five years on, the Archbishop of Canterbury leads a service from the Chapel of Lambeth Palace next week, bringing together curates, priests and bishops from around the country to reflect on the experience of women in ministry. That’s Sunday Worship at the usual time of ten past eight. Building bridges between loneliness and belonging is the theme taken by Radio 4’s worship programmes during Lent. A link to resources for individuals and small groups is available now on the Sunday Worship website.